Chris Solomons has helped saved many lives during his career. Working as an emergency medical dispatcher for Yorkshire Ambulance Service, the 51-year-old has dealt with many cardiac arrest calls – talking people through how to save the life of the relative, friend, colleague or stranger in front of them as they wait for assistance to arrive. Little could Chris, a grandfather-of-four, have known when he woke up and left for work on July 24th 2010 how different that day would be. It would be a day his colleagues would do to him what he had talked many others through, and they would save his life in the process. Incredibly, the whole incident would be caught on camera as a BBC film crew had been recording the team for the BBC series Helicopter Heroes at the time. “I set off to work as usual at 6.30 that morning,” recalls Chris. As the pains worsened Chris decided to pull over and call for assistance but by now things had deteriorated to the point he couldn’t even use his hands properly. He got back in his car and managed to get to work. “When I arrived I managed to get in and attract the attention of one of my work colleagues, James Vine, who is a paramedic. He immediately called the other crew member, Lee Davison, who came in with the bag of the aircraft. Chris was having a massive heart attack, and would later find out one of the main arteries in his heart had become blocked. A heart attack, or myocardial infarction, is distinct from a sudden cardiac arrest in that it is caused by a plumbing problem. This is why Chris experienced symptoms where people who suffer sudden cardiac arrest often don’t have any warning and lose consciousness immediately. But heart attacks can lead to sudden cardiac arrest and in Chris’s case what started as a blocked artery quickly became an electrical problem as it caused his heart’s electrical system to malfunction. “I suddenly went into cardiac arrest and James immediately got me on the floor and started CPR compressions,” continues Chris. “I was down for about ten minutes as both James and Lee performed CPR on me. As you can see in the footage, they had to use an AED on me twice to shock my heart back into normal rhythm. “The next thing I remember is being put into the aircraft and flown to the Leeds General Infirmary to have a stent put into an artery in my heart. Incredibly, Chris was released from hospital after four days and has gone on to make a full recovery. “Looking back I realise just how lucky I was,” he says. “The way I had felt in the car I didn’t know whether to go home but if I had there’s every chance I wouldn’t have made it. It was the first time the guys were doing a shift at that time in the morning – had it been the previous week they wouldn’t even have been there. “So a lot of things worked in my favour that day and those guys saved my life. Chris has since become a spokesperson for the issue of cardiac arrest and has attended many events talking about his experiences. He has returned to work and continues to enjoy a happy and healthy life. “I’m living life and I’m healthy – I’ve cut out smoking and drinking and I’m just taking every day as it comes. “I’ve been able to experience so much and if it wasn’t for the guys doing CPR on me and the AED they used I wouldn’t be here. “I cannot say strongly enough how important it is that AEDs are in communities. Not in locked cupboards, but out there, placed where they are needed. 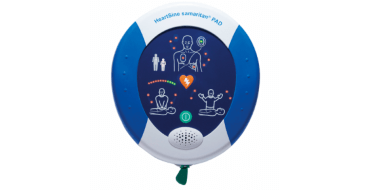 BLS First Aid are a proud distributor of Heartsine Defibrillators (AEDs).